New version of Tales From The Crypt in the offing—get it? "Offing"? The horror series Tales From The Crypt is being revived—according to Dead-line, appropriately enough—although the new adaptation of the classic 1950s-era EC Comics line won’t bear much resemblance to the HBO show that for seven years doled out deathly ironic comeuppance to hundreds of guest stars and massacred just as many puns. Original series producer Gil Adler is partnering with Eureka co-creator Andrew Crosby on an hour-long series that ditches the anthology setup (and thus the “Tales” part, we guess) for an ongoing drama that “uses characters from the comic books in a more modern context.” Which is always a logline that’s a real buzzsaw-kill, kiddies, but them’s the breaks! See, during that last sentence, we would pan back to reveal that we’re standing over a gagged-and-bound producer who’s about to be fed into a sawmill, then punctuate the last phrase by breaking his skull with a hammer. 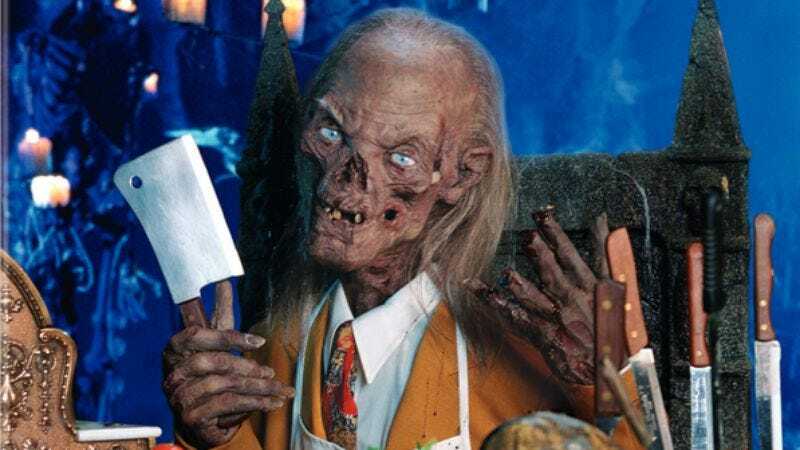 That’s how Tales From The Crypt usually works—or at least, that’s how it used to work, but all bets are pretty much off for the new version, which not only will seek a new, modern direction, but may also tone it down slightly for broadcast networks, who reportedly will be included in the pitch alongside cable channels. Although, while HBO doesn’t seem to be interested, apparently there have been “rumblings” from Cinemax, who recently entered the non-softcore original programming game. So maybe they’re interested in some non-soft-corpse original programming, eh? Ehhhhhhhhhh?